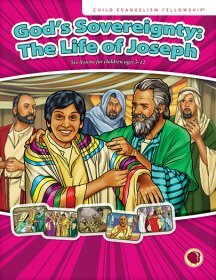 Lesson text for six lessons about the life of Joseph. Text includes a master planning chart, schedule, lesson overview and outline, detailed story line, review questions memory verse teaching and more. 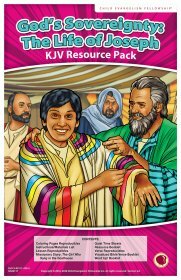 11" x 17" full-color resources: memory verse visuals, The Girl Who Sang in the Goathouse mission story, Word-Up (teaching statement), resource booklet (review games and activities). 8 1/2" x 11" back/white reproducibles: coloring sheets, memory verse bookmarks, Quiet Time sheets, skits, interactive and review games, activities for small group and/or Wonder Time. 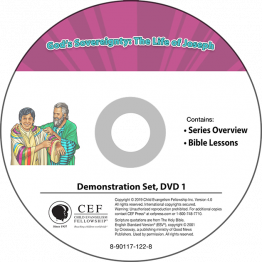 Disc 1: Overviews, complete Bible lessons demonstrations. Disc 2: Demonstrations of songs suggested in the series: Christ Redeemed Us, Have You Heard? I'll Stand for God, Jesus Is Caring for You, No Turning Back, Three Questions, What's the News? He Is Greater (1 John 4:4), He Who Began (Philippians 1:6), In Him We Have Redemption (Ephesians 1:7). 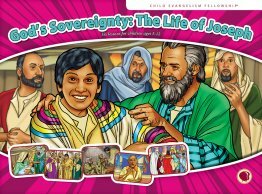 PowerPoint visuals to teach six lessons on the life of Joseph. Includes ppt visuals for flashcards, memory verses (ESV and KJV) and lyrics to suggested songs. 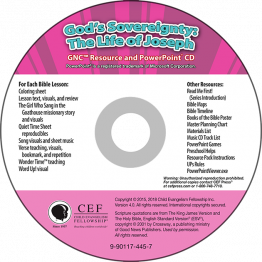 PDF’s of lesson text and other helps: teaching cards, resource booklet, reproducibles (quiet time sheets, coloring sheets, sheet music for songs), The Girl Who Sang in the Goathouse mission story—everything in digital format that is in the resource pack. Only cover revised in in 2019.